The Shadow Machine is a hand-made analog projection system that reanimates two blacksmiths from the late 1800′s, photographed by Eadweard Muybridge and compiled on plate #374 of his Animal Locomotion series. The Shadow Machine was conceived of and created for the The Underbelly Project, an extraordinary, unauthorized exhibition of more than one hundred international street artists in an abandoned subway station in New York City. The Shadow Machine’s projected, ghostly figures hammer away in complete darkness at the far end of the platform, ever-toiling spirits working on a never-finished station that was abandoned generations ago. Inside the Machine, six frames hand-painted on clear plexiglass operate as gobos when lit from behind by narrow beam LEDs. 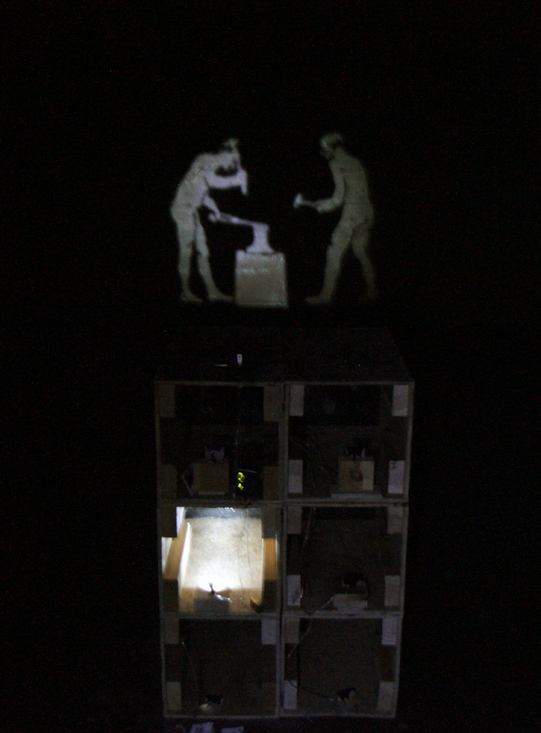 A light sequence, controlled by an Arduino board with custom software using a 9V battery, casts each successive shadow in a loop.